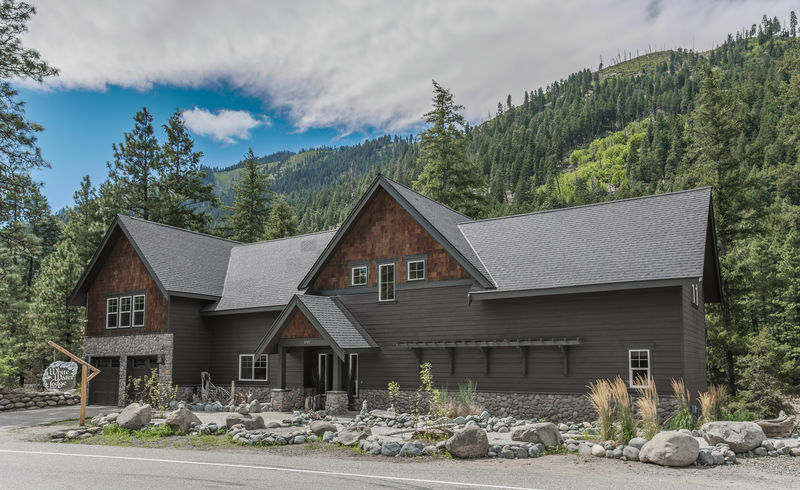 All of the incredible beauty and stunning drama of the Wenatchee River flows below the beautifully designed and spacious White Water Lodge, located only a mile from Leavenworth. 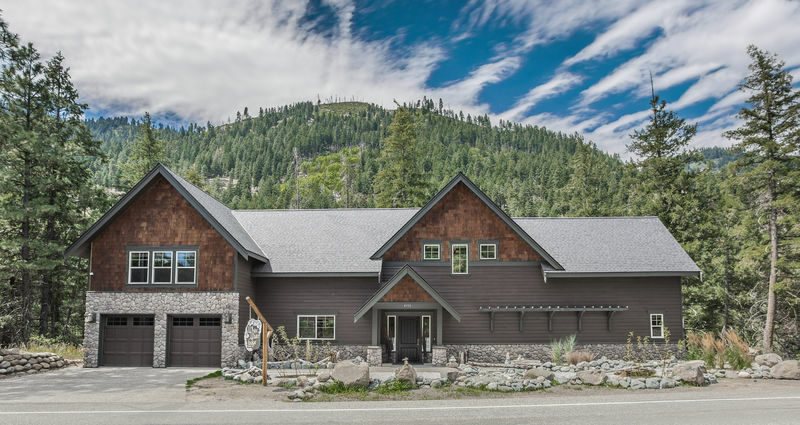 Conveniently located close to the golf course, hiking trails, cross-country skiing, tubing, or shopping and restaurants, White Water Lodge exudes, at the same time, the majesty and wildness of nature, where eagles and deer are often sighted. 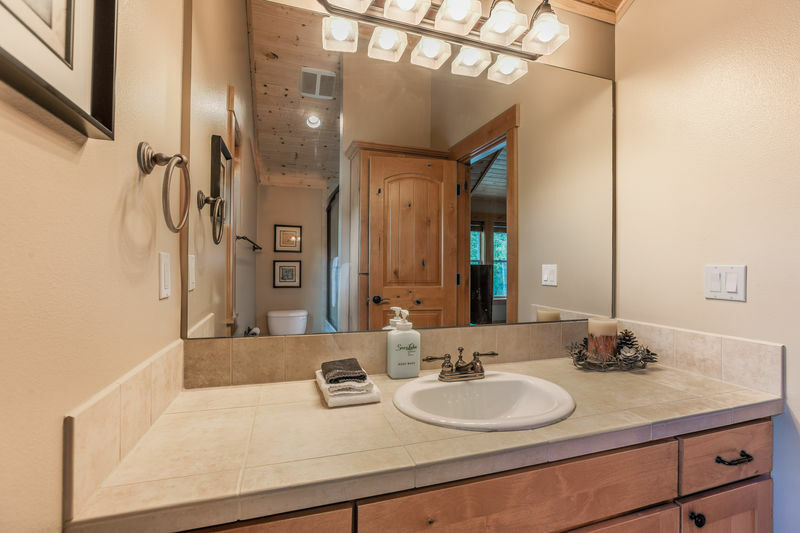 The lodge is gorgeously designed and constructed, with granite counters, river rock accents, tile, wood and natural decor, furnished attractively so as to provide the comfort and relaxation you’re looking for. 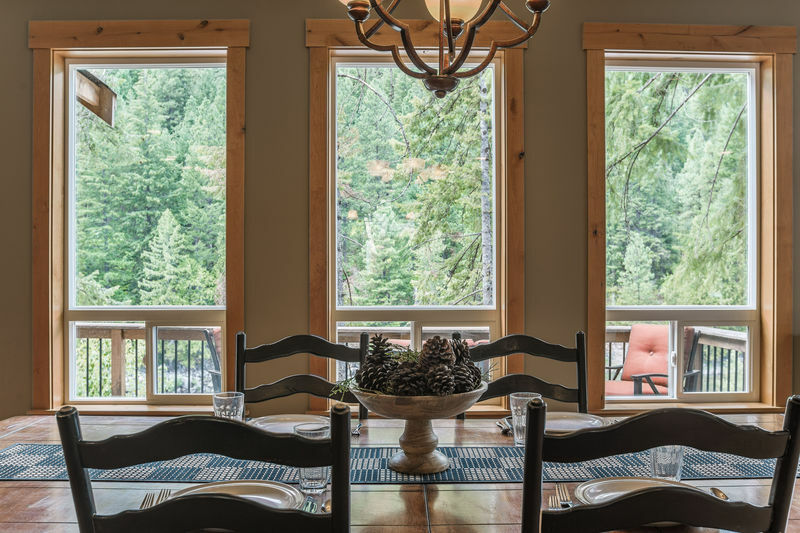 Surprisingly spacious, the kitchen/dining room/living area features a cathedral ceiling and full-view windows that seem to bring the mountains and river right indoors! It’s the perfect way to savor the comfort of the huge, crackling fireplace. 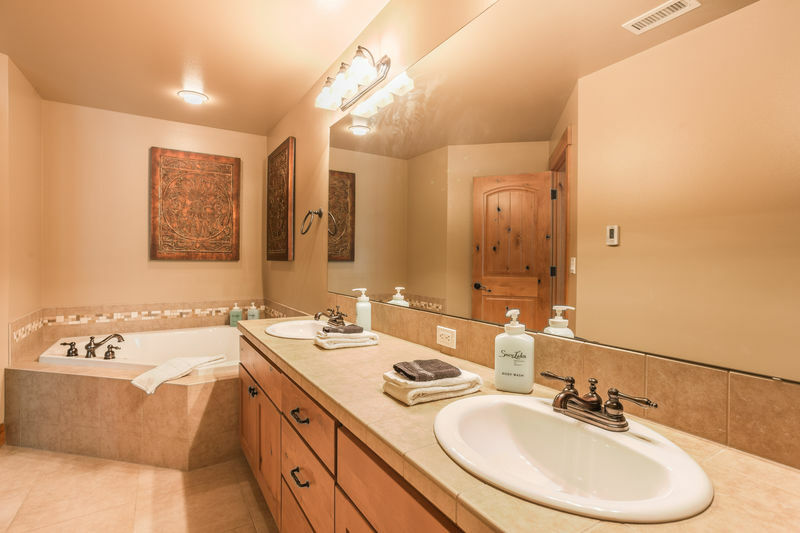 Four “master suites,” each with private baths, plus two more bedrooms that share a bath, provide privacy and comfort that’s perfect for a business getaway, small corporate retreat, or family reunion. 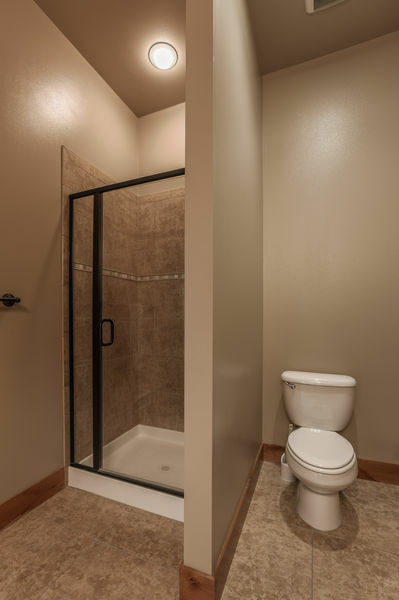 One suite is located on the main floor; a second suite is located at the top of the stairs on the upper floor. 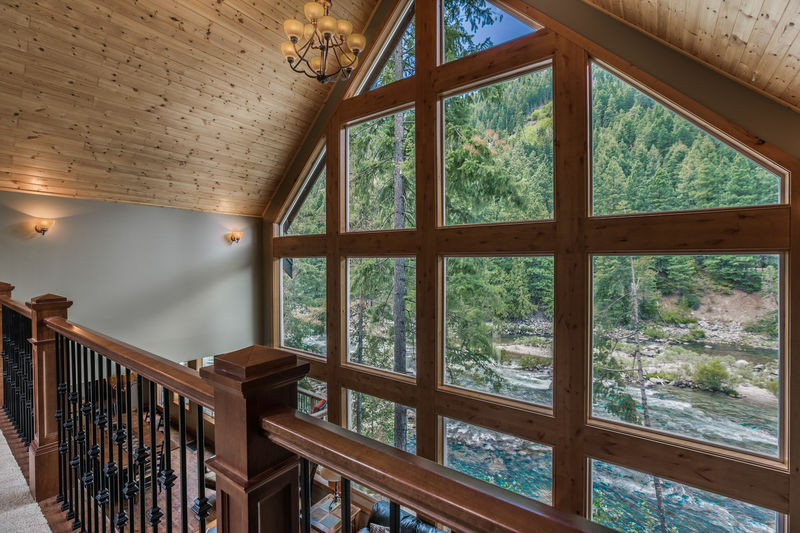 A unique and highly attractive walkway, designed to take full advantage of a constant view of the rushing river, leads through a loft-styled game room, to another stunning upper floor Master suite, as well as two more bedrooms with a shared bath. Additionally, there is a Queen American Leather Sleeper sofa on the upstairs landing. 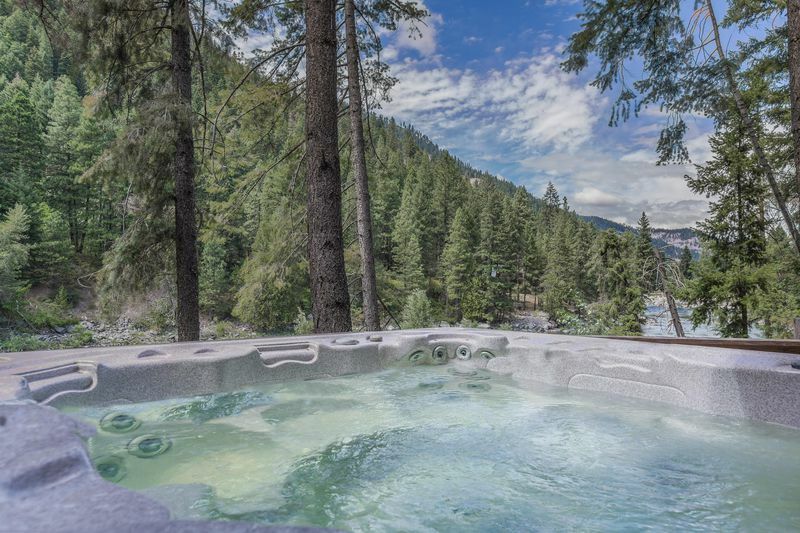 Besides providing access to the private outdoor hot tub that seems perched right over the rushing river, the lower floor also has yet another stunning master suite with a magnificent view. 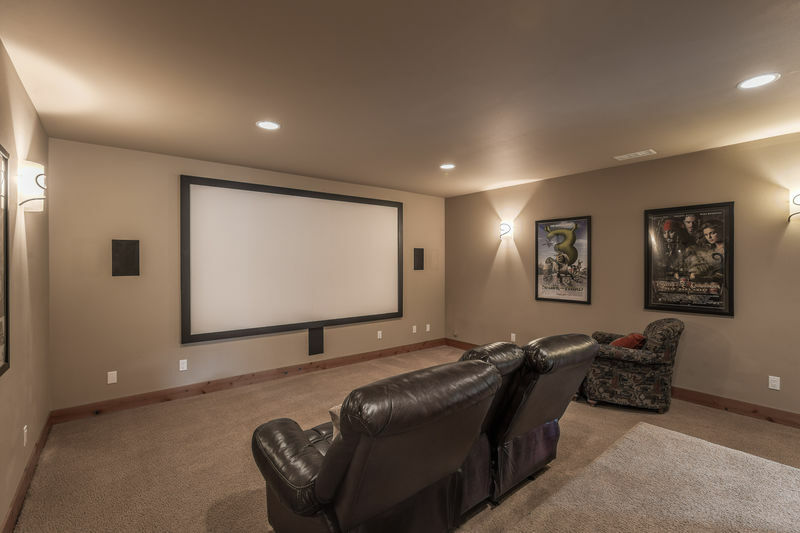 A unique highlight of this lovely place is the home theater, located just off the attractive family room downstairs. A ten-foot screen with projector, and seating for a small gathering makes a truly pleasurable way to relax, along with the pool table. These rooms can also function very well as meeting rooms for small corporate retreats. 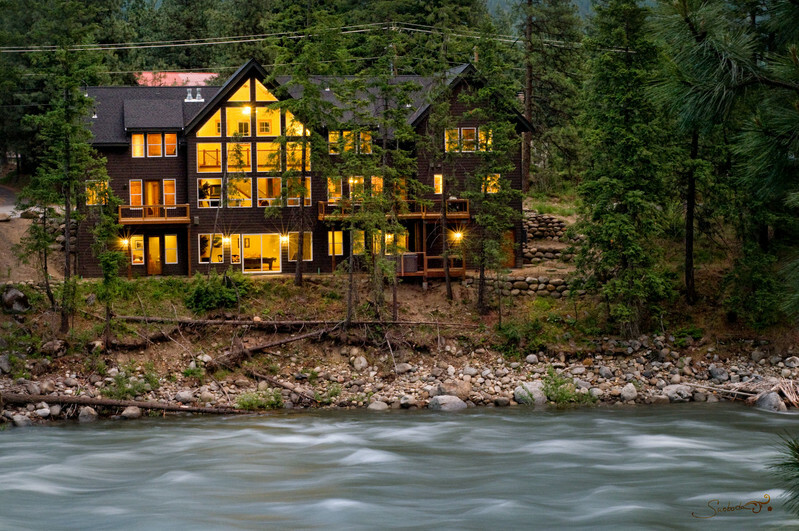 A stay at White Water lodge is an experience that's truly amazing. This is an unforgettable vacation destination! * Please note: White Water Lodge has a 3 night minimum from Memorial Day Weekend through September. 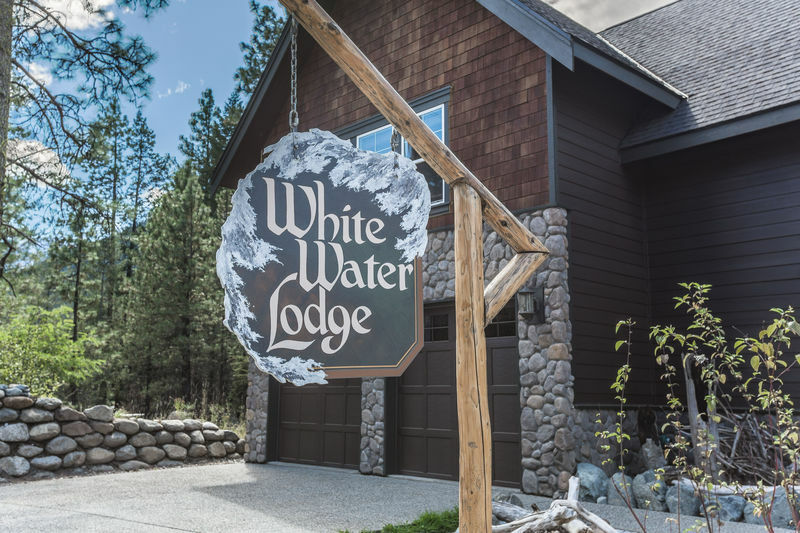 Welcome to White Water Lodge! 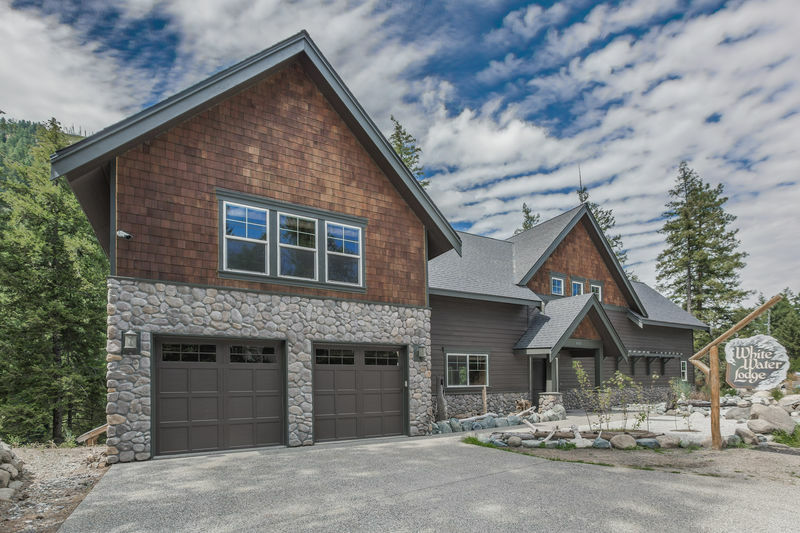 A spacious elegant home that sleeps up to 16. 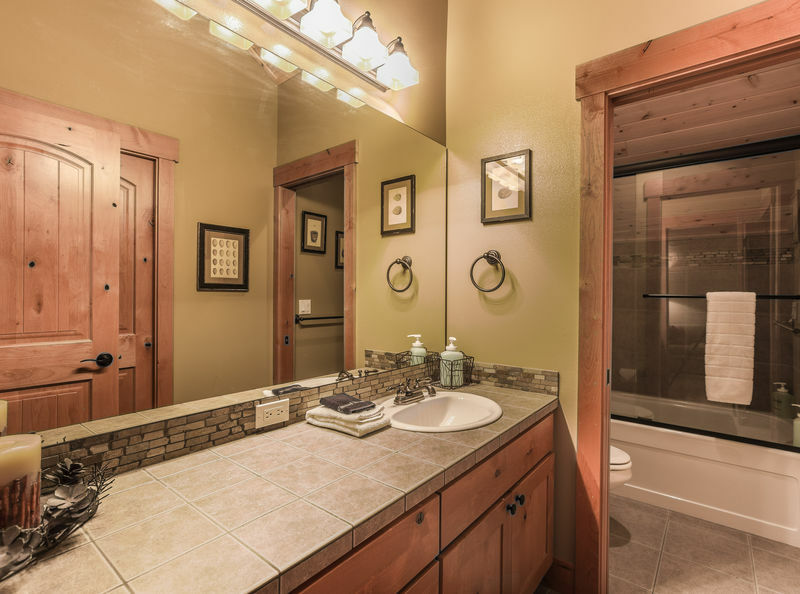 Come visit White Water Lodge! The home was both extremely nice and comfortable, two things that don't always go together. We had such a fun and relaxing time. Nearby hiking was great, and we even took advice from the ap on where to eat(and we were not disappointed). Thank you for creating such a wonderful experience. We had a great time! Amazing house with lots of room! Nice walk into town. Fun watching the rafters. We had a wonderful Thanksgiving! Thanks for such a lovely stay at the White Water Lodge. Great comfortable stay. 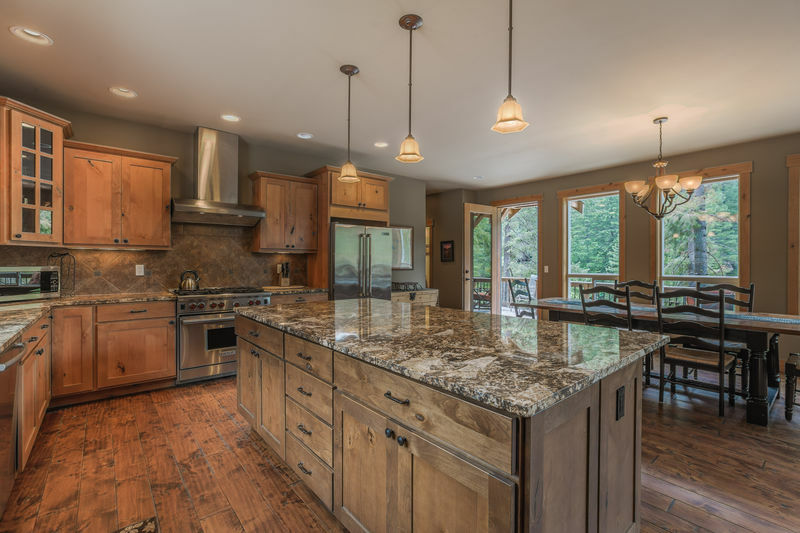 The kitchen was very functional and made our cooking experience a breeze. Very enjoyable stay. We had an excellent stay at the White Water Lodge. 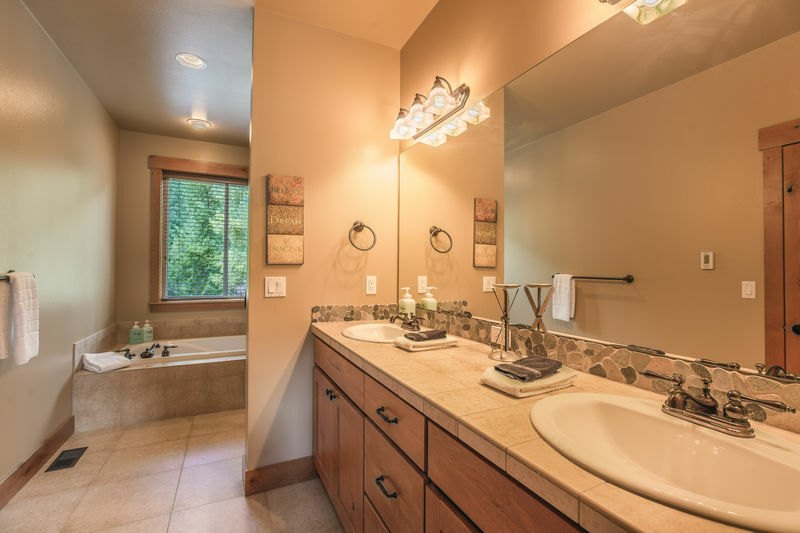 The property is gorgeous, spacious and very well appointed. The owners were very responsive when we had questions. Highly recommended! We're hoping to come back and stay again soon! Fantastic location. Well appointed cabin. Great service! This is such a beautiful home! Our family spent a wonderful Thanksgiving here. The house has tons of space so there was more than enough room for all of us. 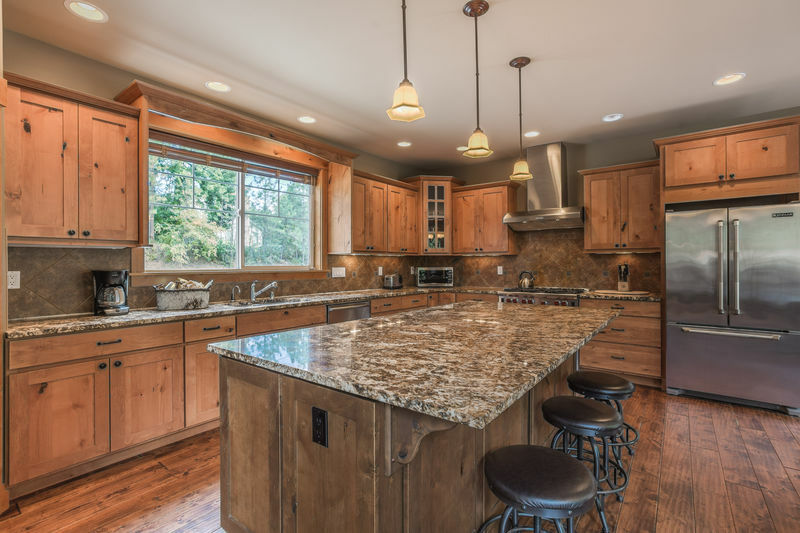 The beautiful kitchen made cooking our Thanksgiving dinner a breeze! 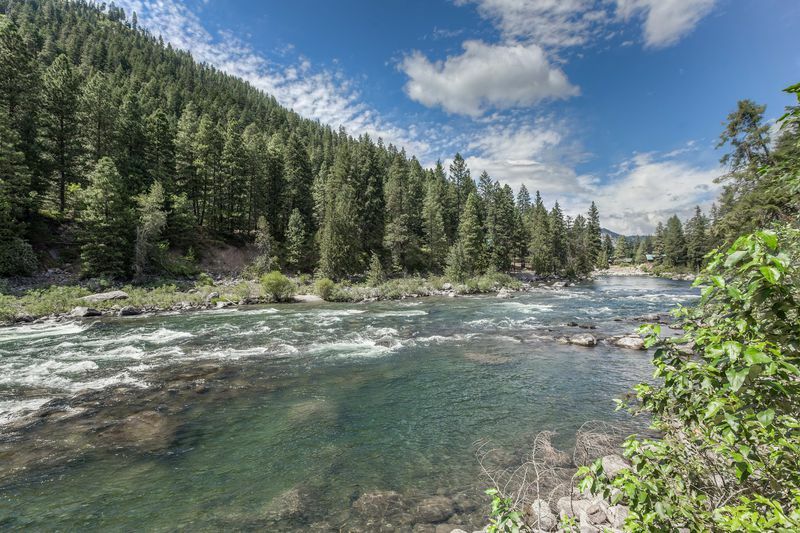 The sound of the river and the scenery were the icing on the cake. We will definitely be back! 16 of us this yr. House is large, comfy and peaceful. Will be booking again. 16 of us stayed here for our annual girls weekend in Leavenworth. The house was perfect! 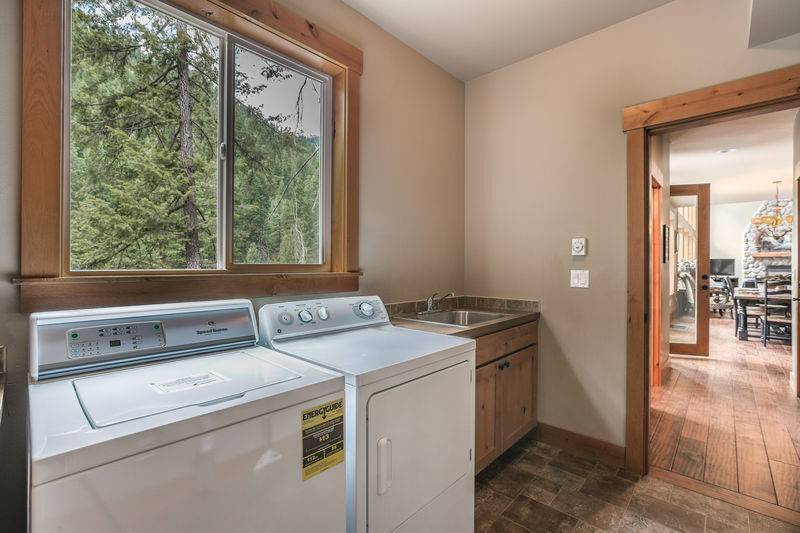 Lots of bathrooms, close to town, close to hiking, a spacious kitchen with a back up refrigerator in the garage, lots of seating at the table, the beds were comfortable, and the sound and view of the river on the back side of the house was very relaxing. EVERYTHING was great. We've stayed at several VRBOs over the past 10 years, and this one worked best for our group. My only complaint is that there wasn't a frying pan for preparing breakfast items. 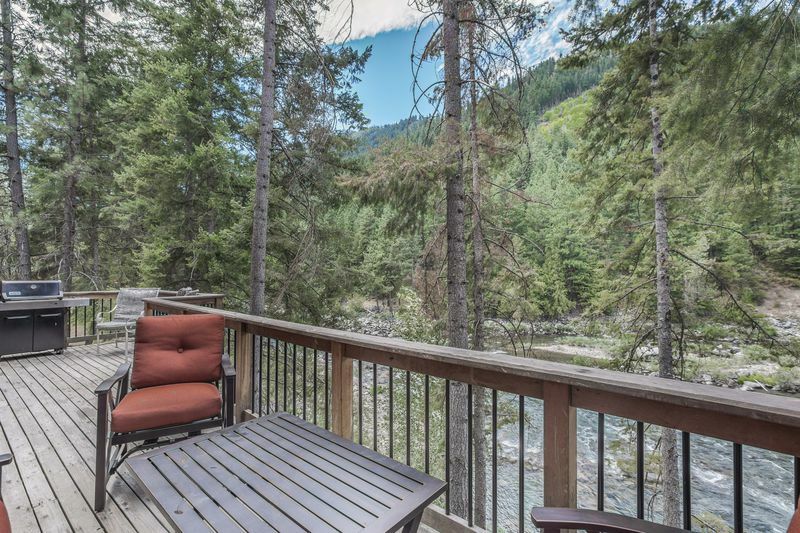 Large lodge on the Wenachee River. Beautiful home for a large group. This was a great home for our family reunion. We had 6 bedrooms with 6 1/2 bathrooms. Plenty of room for everyone. We had 13 family members from all over the United States. Each bedroom was large and very quiet. The media room was huge. Everything was well designed. Downstairs there is the Media room, Hot tub, Pool table, and one bedroom. The main area had a Large kitchen with a lot of good storage, living room, and one bedroom The garage is also on this level with a refrigerator in it. The upper level had one bedroom on the west side and 3 bedrooms on the east side. There is also a common area where you can sit or have an additional guest sleep. The kitchen was well stocked and had a pantry which came in handy during the week. It is right on the river and you could hear the water if you opened the doors. They had 3 balconies in which you could relax. Our group had an incredible time here. 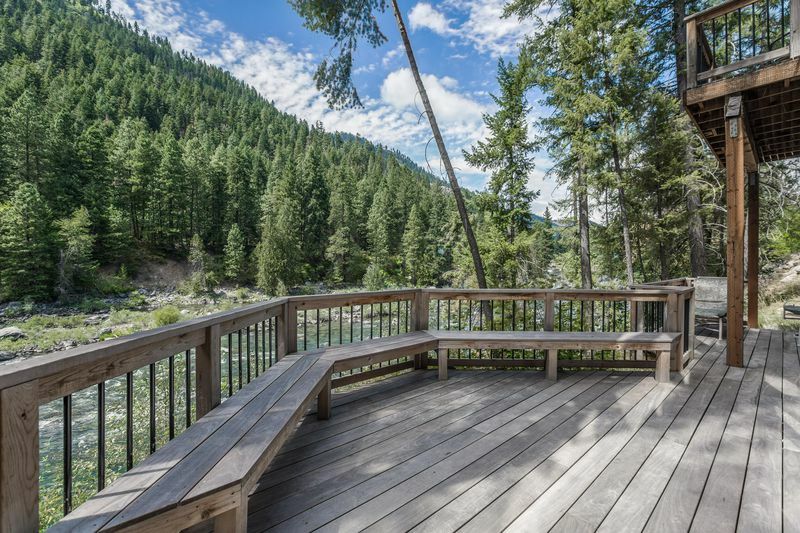 Beautiful location on the river. Plenty of space. 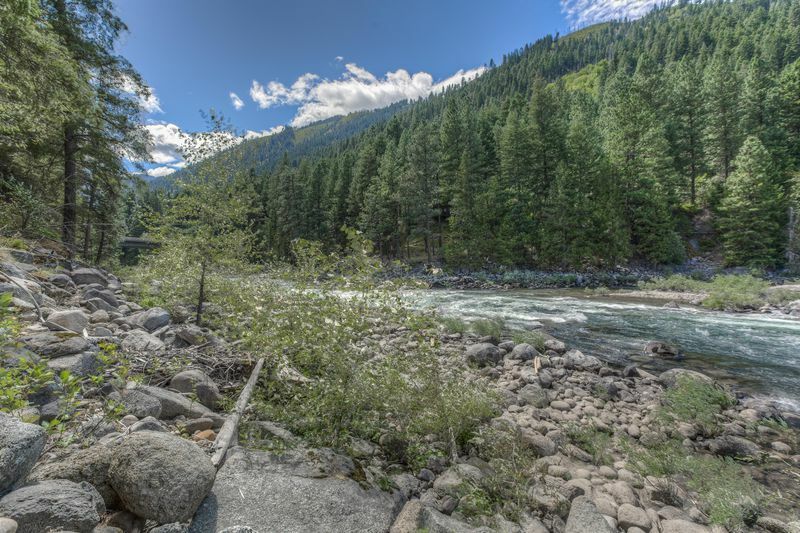 Easy access to and from Leavenworth. We will definitely be back! The White Water Lodge is a spectacular house that gave everyone space, if the wanted to stay in their room. The kitchen area was a great place for everyone to sit and enjoy each. The house itself was in a great location, just outside of town, but close enough to walk into town. I had family from California, New York, Idaho, and Minnesota visiting and they had nothing but rave reviews for the WWL! Thanks! Beautiful home, spectacular views!! We will return to this home! This is one of those unique properties that was better than advertised! We had twelve adult siblings (Youngest is 60) and this property had something for all of us! Especially bathrooms lol !!!!! So well equipped, and warm! The river is so close and makes a gorgeous sound 24/7! The whole family loved the shopping and restaurants, even us golden agers could walk to town on at least one occasion! The Kitchen is well appointed and more spices available than advertised🤗 The maintainance and cleanliness impeccable, this will remain our first choice in the area! Wonderful property, our second time staying here and it won't be our last! 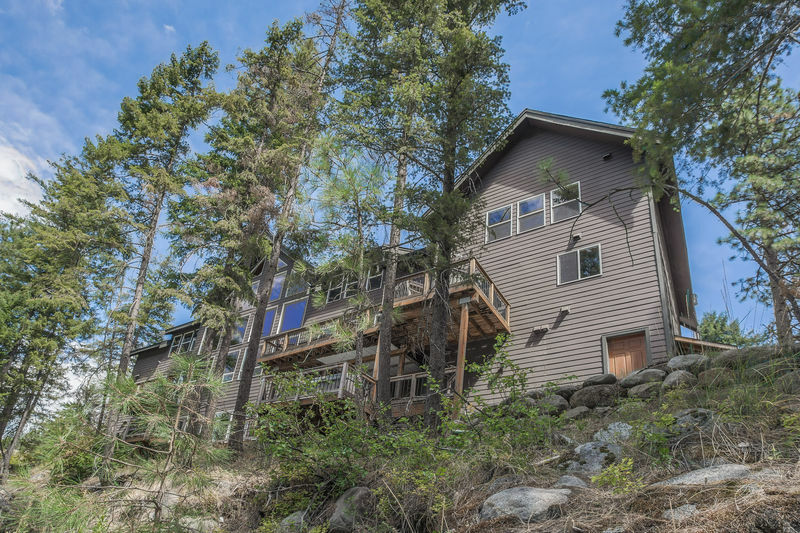 This is such a great place with everything you could possibly need situated right on the river about 1/2 mile from town. Highly recommend this cabin for groups of 14-16.